A revered Sufi saint and a Hussaini Syed of the highest order, whose entire life was a reflection of SHAR-E-NABAVI(SAW), whose every breath reminiscent of ZIKRULLAH, having undertaken Baith from the following four traditions (Silsila) – Quadri, Chishti, Nakshbandi and Rifaai. To his left lies the Mazar-E-Aqdas of his wife HZ. SYEDA HABEEBUNNISA (RA) fondly referred to by pilgrims as AMMAJAAN. 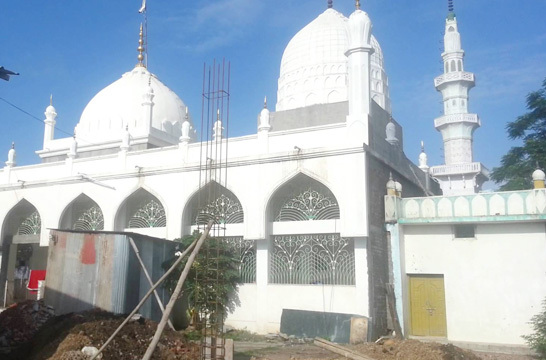 The Dargah Shareef is situated in Rahmatabad / A.S.Peta, which is one of the most visited place in nellore. It is 53 km from Nellore and 10 km from Atmakur. Hazrat Syed Nayab-e-Rasool spent his whole life in teaching the qualities of islam, sunnah, Love and humanity. He was a great sufi saint who rendered great services to humanity and mankind through out his life and gave the message of peace and thought good preachings of islam irrespective of caste, creed or colour. It is one of the unique place where Hindus and Muslims blend together and stand as an illustration of National integrity. He even arranged funds and send to madina shareef for the development for the sake of islam for educational institutions and at the time of crisis to serve the humanity. Hazratha Amma Jan Saheba rendered great khidmath to Hazrat Syed Nayab-e-Rasool. Historically Sarkar Nayabe Rasool is referred to as Hazrat Haji Syed Khwaja Rahmatullah (RA) Nayabe Rasool and is counted among the Hussaini Sadaat's (Descendants of the great Hazrat Syedna Imam Hussain Razi Allahu Ta'ala Anhu). His father Hazrat Khwaja-E-Alam Nakshband Alaihirrahmah had migrated to India from Tauran (northen parts of Afghanistan and present day Uzbekistan etc.). Khwaja Rahmatullah's father upon his arrival from Tauran, stayed for a brief while with the Asif Jah (Awwal) and thereafter was appointed as the Qateeb at the Jamia Masjid at Belgaum (Karnataka). Hazrat Khwaja Alam married in Belgaum which was also the birth place of Khwaja Rahmatullah. His (Khwaja Rahmatullah's) date of expiry has been given as 26 Rabbi Ul Awwal 1195 Hijri which translates to 1781 AD in Georgian Calender. His age has been given as 90 Hijri years and thus his year of birth can be counted back to 1105 Hijri (1694 AD). Khwaja Rahmatullah took permission from his father and went to stay with his maternal aunt at Kurnool where he recieved his formal education and also took employment in the royal stable. Meanwhile he also visited Bijapur and took Baith from Hazrat Alvi Buroom (RA.). Later he performed Hajj (1151 Hijri/1737 AD) and also took Baith from Hazrat Ashraf Makki (RA) under the Nakshbandi tradition in Makkah Muazzamah from where he proceeded to Madina Shareef. After returning from Hajj Khwaja Rahmatullah stayed for a brief while at Kurnool and later went to Nandyal where he got married. From Nandyal Khwaja Rahmatullah came to Udgir Hill Fort and in 1748 AD bought some land and settled in Ana Samandar (Anuma Samudram) which later came to be known as Rahmatabad Shareef (named after Khwaja Rahmatullah himself). Hazrat Syeda Habeebunnisa (RA) was the second wife of Khwaja Rahmatullah and is popularly known as Ammajan by Hindus and Muslims alike. She was the daughter of the Nawab of Kurnool. In 1748 AD Khwaja Rahmatullah constructed a make shift mosque in Rahmatabad and named it Madina Masjid. Many people came forward to convert it into a permament structure but Khwaja Rahmatullah refused any help and later in 1762 AD he single handedly converted the makeshift structure into a grand one. There is an inscription on the forehead of the mosque which reads "This Stone Has Been Brought From Madina Munawwarah" but it is not certain whether Khwaja Rahmatullah had brought the stone himself or had got it through someone else. Khwaja Rahmatullah did not had any children through his second wife. His second wife Hazrat syeda Habeebunnisa had constructed a grand dome atop the mazar of Khwaja Rahmatullah after his expiry. She herself was laid to rest next to the Mazar of Khwaja Rahmatullah inside the same dome after her expiry. According to the book 'Bahr-E-Rahmat' at the age of 90, Khwaja Rahmatullah fell seriously ill and expired on Friday 26 Rabbi Ul Awwal 1195 Hijri (22nd March 1781 AD) after Maghrib at Udgir. At the time of performong Ghusl his heart was still in a state of Zikr which was witnessed by everyone present there. His body was then brought to Rahmatabad and was laid to rest in the courtyard of the mosque that he had built. Today, a grand dome adorns the Mazar-E-Aqdas of Hazrat Khwaja Rahmatullah Nayabe Rasool and Ammajan and is frequented by thousands of pilgrims irrespective of caste, creed, religion and status. Every year on the 7th, 8th and 9th day of the Islamic month of RABBI-UL-AWWAL, the yearly SANDAL and URS of AMMAJAAN is celebrated with great religious fervor, while that of HZ. KHWAJA NAYAB-E-RASOOL is celebrated on the 25th, 26th and 27th of the same month.